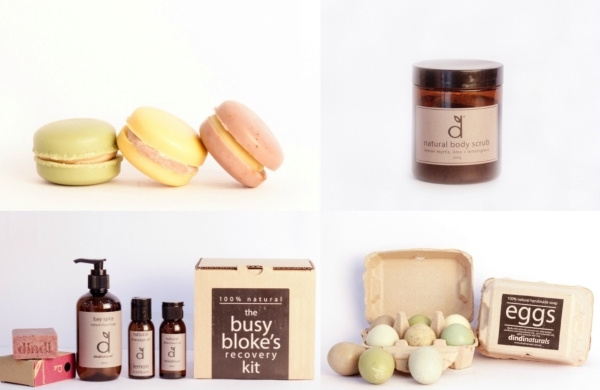 VD Bio Essentials has introduced in India fabulous organic cosmetics from Australian brand Dindi Naturals. Here are some of their products that we absolutely love. Stop using harsh soaps on your body and try out instead these gentle and innovative ones from Dindi Naturals. The Dindi Macaroon Soaps look deceptively alike the fashionable French macaroons and are made from Lemon Myrtle, lime, geranium, lavender and tangerine. Another interesting product is their egg soap, which comes packed in super-cute egg crates! It is offered in six different natural scents and is made from olive oil, shea butter, coconut oil, herbs and pure plant oils. Not only are these soaps amazing for your skin but will also make bathing a lot of fun, especially for children. A perfect gift for your man, this kit contains products to rejuvenate his skin. The pack includes massage oil, liquid soap, after-shave oil and a soap bar. The nourishing massage oil is made from grapeseed, coconut and macadamia oils along with native lemon scented ironbark essential oils. Just one or two drops of this after-shave oil keeps the skin hydrated and smelling great for hours. It is composed of rosehip oil, macadamia oil, lashings of Australian sandalwood oil and lime. The soap bars from Dindi Naturals are blended with cold pressed oils including Australian olive, macadamia, sunflower, almond or hemp, along with plant butters such as shea, cocoa or mango. They are offered in a variety of scents. The liquid soap on the other hand are also very gentle and may be used for hand or body wash.
Another great product for men is their Shave soap, which may be used to create a great lather and is 100% palm-oil free. It is handmade from ingredients like saponified olive oil, coconut oil, shea butter, castor oil, macadamia oil, pure essential oils of lemon myrtle, white cypress, rosewood, lime and cedar wood. The natural oil-based scrubs from Dindi Naturals are perfect for exfoliating you skin. They gently remove any dead skin cells, fake tan etc. They are made from finely ground pumice stone and extra-virgin olive oil that ensure you are left with a clean, smooth and soft skin. They wash off easily and don’t dry out the skin either. Pick from either of the two scents offered: a blend of lemon myrtle, lime and lemongrass or a combination of lavender, rosemary and patchouli. Their store is located in Gurgaon’s Galleria market. You may connect with them at info@vdbioessential.in or give them a ring at +91-9910149439. Tagged Beauty, Cosmetics, LifeSpice, Luxurious lifestyles, The Good Life Luxury Exhibition. Bookmark the permalink.